Winnetonka High School student Patreice Coccia aspires to be a medical examiner someday. Through KC HealthTracks’ inaugural summer camp, she received a behind-the-scenes, hands-on introduction to a career in healthcare. The goal of KC HealthTracks is to increase the number of high school students from under-resourced area schools to attend higher education training programs to grow a skilled, diverse workforce for the healthcare and biosecurity industries. The U.S. Department of Health and Human Services Office of Minority Health National Workforce Diversity Pipeline awarded a $2.5 million grant to the University of Missouri-Kansas City School of Nursing and Health Studies to direct KC HealthTracks. Partners include KC STEM Alliance, Metropolitan Community College-Penn Valley, Project Lead the Way, West Central Missouri AHEC (Area Health Education Center), Missouri HOSA (Health Occupations Students of America)and the Kansas City Area Education Research Consortium. The project will be available in Kansas City during a five-year period. “This initiative is unprecedented as an upstream solution, providing workforce preparation through exposure, academics, advising and social support that begins in high school and continues through college,” said Ronda Manney, camp director and clinical assistant instructor at the School of Nursing and Health Studies. 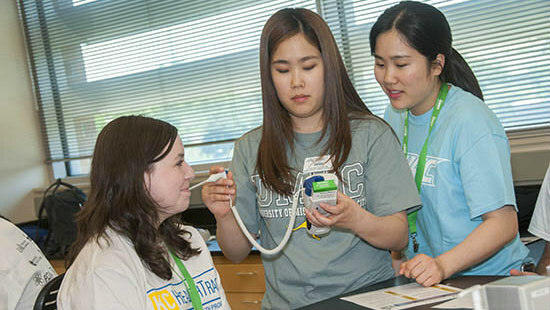 KC HealthTracks includes support from faculty advisers as mentors; campus visits; math and science tutoring; ACT preparation and the week-long summer program. Just a few of the experiences during the camp itinerary: making dental molds at the School of Dentistry and creating anti-itch cream at the School of Pharmacy; reviewing X-rays and scans at the School of Medicine; participating in learning to take vital signs and working in the simulation labs with patient situations at the School of Nursing and Health Studies, presentations at the Kansas City Public Health Department; auxiliary health professions at Rockhurst University and a tour of the “Body Worlds” exhibit at Union Station. Watch a video about the activities. The Kansas City area high schools and districts that are part of KC HealthTracks are Center High School from the Center School District; Fort Osage High School from the Fort Osage School District; Grandview High School from the Grandview School District; Ruskin High School from the Hickman Mills School District; Truman High School, William Chrisman High School and Van Horn High School from the Independence School District; East High School from Kansas City Public Schools; and North Kansas City High School, Oak Park High School and Winnetonka High School from North Kansas City Schools. Funding to the districts is used for teacher salaries who teach Project Lead the Way courses. Originally posted on the UMKC School of Nursing and Health Studies website.